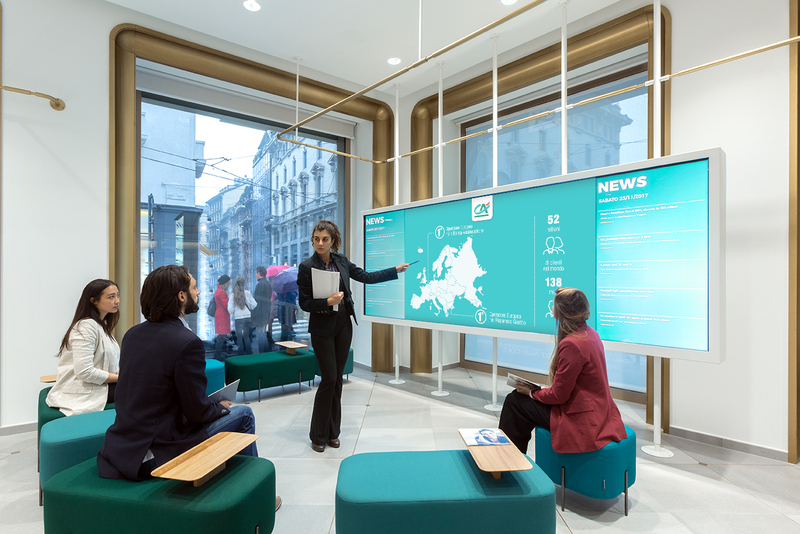 A new format project specially designed for the major Italian branches of Crédit Agricole banking group, to perfect the Customer Experience model and start the new City Branch service – where the recognisable features of each location are well highlighted by giving attention to the historical and cultural background. Crédit Agricole Italia is the seventh Italian banking group, with 800 branches within ten regions. Beyond the group leader Crédit Agricole Cariparma, it is composed also by FriulAndria in Veneto and Friuli-Venezia Giulia, and Carispezia in Liguria and in Massa-Carrara territory. In past, Cariparma Crédit Agricole had been the Italian first mover in investing in the relational aspect, putting client in the heart – for example removing the desks. Today Crédit Agricole, one of the major worldwide banking group with 52mln clients all over 50 Countries, continues to stand out in the Italian scenario, becoming the first bank to integrate new welcoming and relational services apt to boost the customer experience and introduce a fresh approach to communicate and explore the bank offer as well. A specific architectural project differently designed for each City Branch is DINN!’solution to enhance the distinct aspects that every building holds and, at the same time, offer a unique Customer Experience for all the branches. In order to keep uniformity within the whole network, DINN! conceived a huge branding operation in order to reflect the bank’s own values and positioning – though reveiling the actual remarkable variety of the whole Crédit Agricole group. Starting from the format My House Bank – previously developed by DINN! 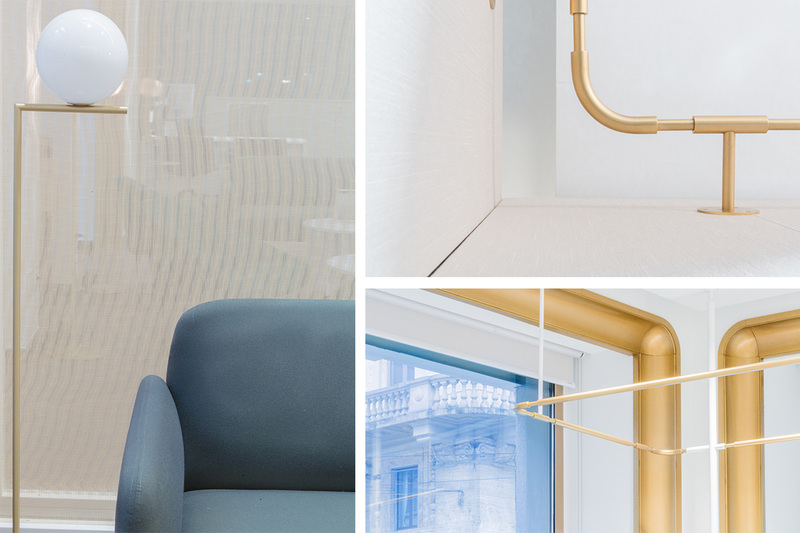 for Cariparma-Crédit Agricole – the new concept is reinterpreted through an innovative storytelling way to communicate the bank products. This strategy effectevely reaches all the clients that prefer to manage their own choises more and more indipendently. The transformation of the customer experience is visibly conveyed by a unique distinctive design, that takes inspiration from the values of internationality, innovation, solidity and the smart combination between more value and less complex transactions. To the service model already implemented to the whole branch network, DINN! integrates a wide area in the hall for welcoming the clients and let them exploring the whole bank offer. The human centric approach, the historical enhancement, the premium character and the retail customer experience are all the innovative ingredients of utmost importance of this project. “Crédit Agricole City Branch in Milan represents an original spatial archetype, specially designed on the brand’s values. This concept has the quality to put together an innovative customer experience with an innovative communication of the whole banking offer system. A multifunctional space where to meet the client, present the products and host temporary events as well. The new City Branch joins the formats that DINN! has recently designed for Crédit Agricole Italia, achieving an improvement of the space quality, a better customer experience care and also the optimization of the business efficiency” Massimo Fabbro, DINN! Founder and Chairman. The new strategy designed for the enhancement of the customer experience sees also the introduction of the Product Gallery, that is an area specially dedicated to the narration of the bank product, which the client meets just once he enters inside the branch. 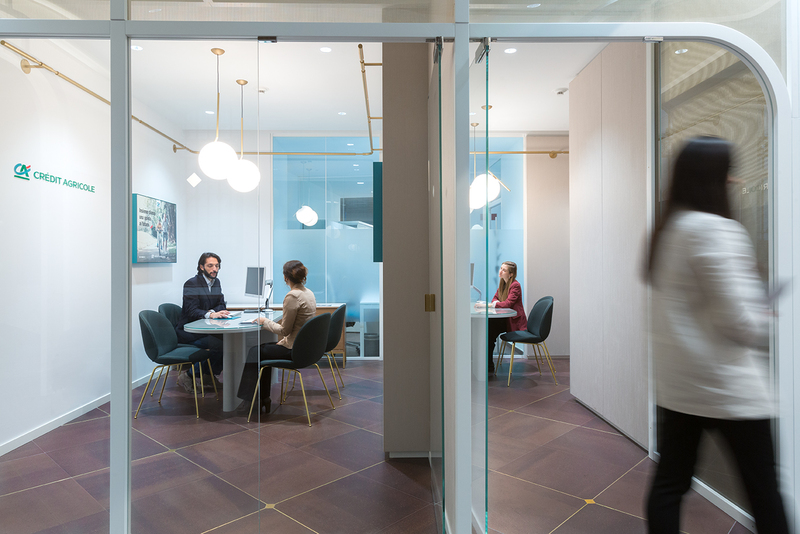 The new exposure of Crédit Agricole offer inaugurates the space before accedeing to My House Bank – the relational area further boosted to be more welcoming and to create new opportunities of interactions with clients. With a fresh interpretation of some modern classic features, DINN! keeps the existing flooring and the arch system, that become the recurring design motif. Moreover, inside the branch, the full open window displays give high visibility to the interior design from the outside. Once inside the branch, the client immediately realizes the primary role played by the technology, projected to semplify the processes, convey the bank’s values, show the products within the exhibition area and enrich the customer experience – also thanks to the presence of the self point 24H and the large displays. The concept implements also a new business operations area, provided with more functions and more space for both the consultancy and the appealing programme of events that are periodically organized within a space which can flexibly change depending on the specific situation. 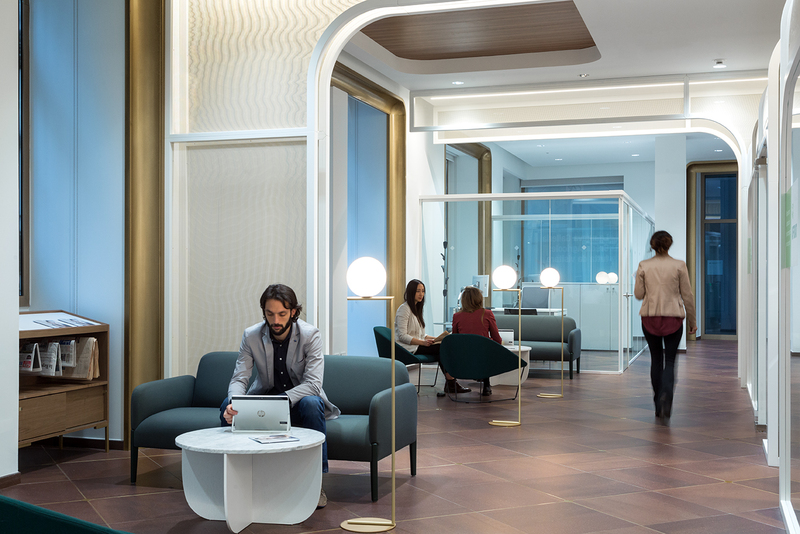 Born as transactional, developed as relational, now Crédit Agricole becomes a new service branch able to provide always innovative solutions within a continuously changeable scenario. The first new italian City Branch model is set in Milan, Via Armorari 4.